Master Craftsman Keith McAvoy also wears a second hat as 1st mate on the "India Marie." Keith claims he's graduated from he school of hard knocks, but if the truth be known Rensselaer PolyTech is the more likely prospect. Captain Whit purchased the Gath III on Kieth's wedding day 14 years ago, and he's been married to her ever since, just ask his wife Mary Ann. Keith's a superb craftsman who was most instrumental in refitting and rebuilding the Gath III. Keith spent over six years working with my sons and I to install the new oak ribs, cedar deck, cedar windows, Volvo diesel engine, housetop, rails, new head, etc., so that you can enjoy the thrill of fishing on "Maines classic Gath III". Keith also completed all the retrofit projects on our second vessel "India Marie" and he is currently redesigning the fishing systems aboard our newest vessel Gath IV. Since 2002, I've been honored to have him join me on the" India Marie" as her 1st mate. Many of you finally got to meet the man behind the scenes. He really adds to the professionalism of our organization and he is a stable influence and guide that my sons respect and look up to. Keith spent all his summer days fishing as a boy on "Drakes Island, Me." where he learned the ins and outs of inshore sports fishing. You can be assured of the best care and guidance a mate can give, if your lucky enough to have Keith on your charter. On left, "1st mate Keith McAvoy" celebrating Fred Burket's 89th birthday catch aboard the India Marie, with Captain Den at the helm. 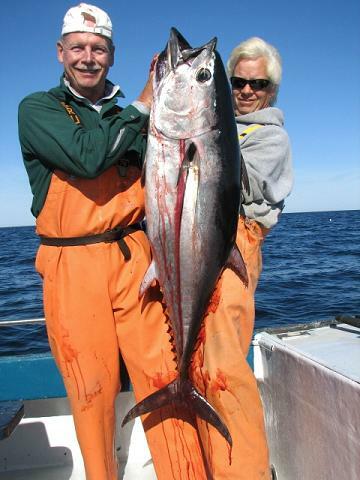 And on right, Keith with Olympic bobsledder Al Turner (NY) and his 110 pound Blue Fin Tuna.